If you have ever had the ambition to keep your own bees and generate your own distinctive honey this is the book you will want to get. 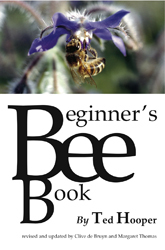 Written originally by Ted Hooper, author of The Bee Friendly Garden, and revised and updated by Clive de Bruyn and Margaret Watson, it walks you, step-by-step through the dos and don'ts of this fascinating hobby. The photographs are beautifully detailed and the text, written by someone whose love of bees is evident, is clear and insightful. At a time when colony collapse is threatening agriculture around the world more people are taking up the fight for these essential creatures. This book shows you how to go about joining the growing number of enthusiasts around the globe answering the challenge.